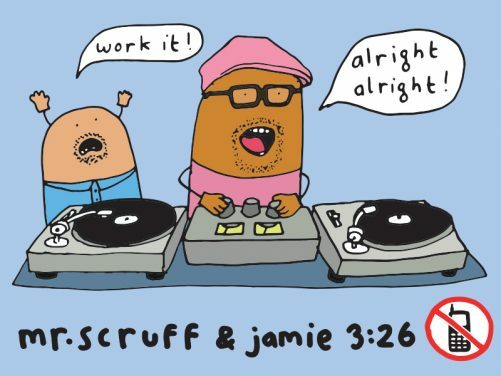 The original Manchester residency in its 19th year.. Mr. Scruff and Jamie 3:26 will be rolling up their sleeves for a 5 hour DJ session of jazz, soul, hip hop, funk, disco, deep house, reggae, afrobeat, latin, electro, techno, new wave and plenty of goodies that don’t fit into any category. All welcome, regardless of age, nationality, mobility, gender or sexuality. Regulars & first timers getting down together… mixed up music for a lovely mix of people! MC Kwasi will be on hand with microphonical vibrations and general assistance. Please don’t use phones on the dancefloor. We ask this because we want the dancefloor to be a place where everyone can be in the moment. If you’re tweeting, texting, bidding for a pair of socks on eBay or taking a picture of your friends, you’re not only out of the moment, you also might be making it hard for someone else to be in the moment. The bar or balcony is a much better place for this. Be nice to everyone. Tip the lovely bar staff. Say excuse me if you bump into someone. We have reduced the capacity by 50 people to give more space to dance. Use this space to throw some extra special moves. Respect other people’s space. If someone’s making you feel uncomfortable in any way, please let Security or someone who’s working know. We will try our best to nip it in the bud. We always hold back a few spaces on the door, so do come down early if you don’t have a ticket. If you have a wheelchair, please let us know in advance (at least a week’s notice is ideal) & we will do our best to reduce the number of tickets on sale to give more room to manoeuvre. Please contact the BOTW operations team on 0161 830 3888 or email info@bandonthewall.org. The same contact should be used if you need to bring a personal assistant.